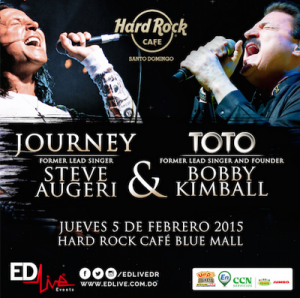 Hard Rock Café Santo Domingo presents together Steve Augeri, the former lead singer of Journey, and Bobby Kimball, the former lead singer and Founder of TOTO. They are part of the Legends – Voices of Rock Tour that has been touring the world. They will be singing their greatest hits. Some of the hits of Journey include ” Don’t Stop Believin'”, and “Any Way You Want It”. Some of Toto’s famous songs include “Africa” and “Rosanna”. The concert is at Hard Rock Café in the Blue Mall Santo Domingo on February 5, 2015 starting at 8PM. Tickets can be purchased at UEPA and the Hard Rock Rock Shop. More information call 809-686-7771. Events concert, hard rock cafe. permalink.